It had been about two months since I had been hiking and climbing in the White Mountains, and I was definitely ready for another trip. The snow had almost completely melted away and the weather was perfect for being outdoors. 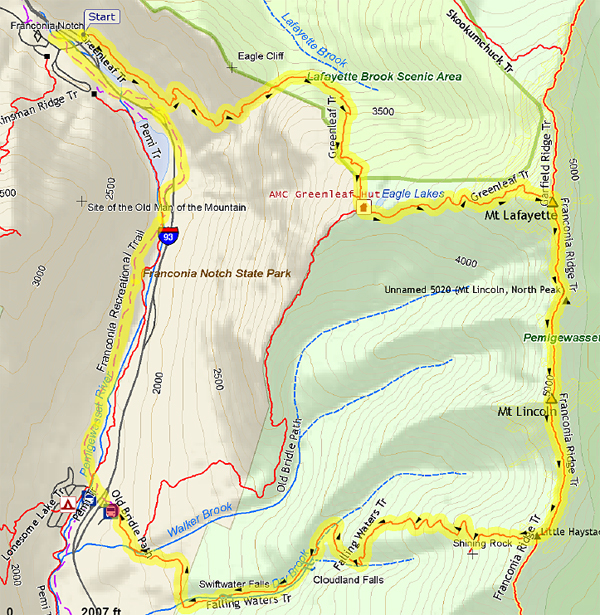 I also wanted to climb something different before I began working on my adopted trail, the Mt Clinton Trail, where I usually limited my excursions to the nearby Southern Presidential peaks such as Pierce, Jackson, and Eisenhower. I hadn't been on the Franconia loop for seven years (although it was hard to believe that it had been that long ago), and I had never approached it via the Greenleaf Trail through Eagle Pass, so I decided to park at the Cannon Mountain Ski Area, hike up the Greenleaf Trail, cross Franconia Ridge, descend the Falling Waters Trail, and then return to my car on the Franconia Notch bike path. The lower part of the Greenleaf Trail is reasonably level for about a half mile, and then starts to switchback moderately up the ridge. The level walk through Eagle Pass was impressive; the cliff face would be a good site for eagle eyries if there are still any eagles around. Beyond the pass, the trail continues switchbacking a bit more steeply the rest of the way up to Greenleaf Hut, where it meets the Old Bridle Path. The hut was still open on a caretaker basis, and the friendly caretaker was busy mopping the dining room floor, which hadn't been cleaned yet since the fall. It had been a wet month and this was the first dry sunny day in a while. After dousing the floor with plenty of bleach-laced water from his mop and bucket, he sucked up the resulting puddles with a shop vac, which was run using the hut's solar and wind power generators. After talking with him for a while, I bought a new 2011 tee-shirt and headed up the summit cone. 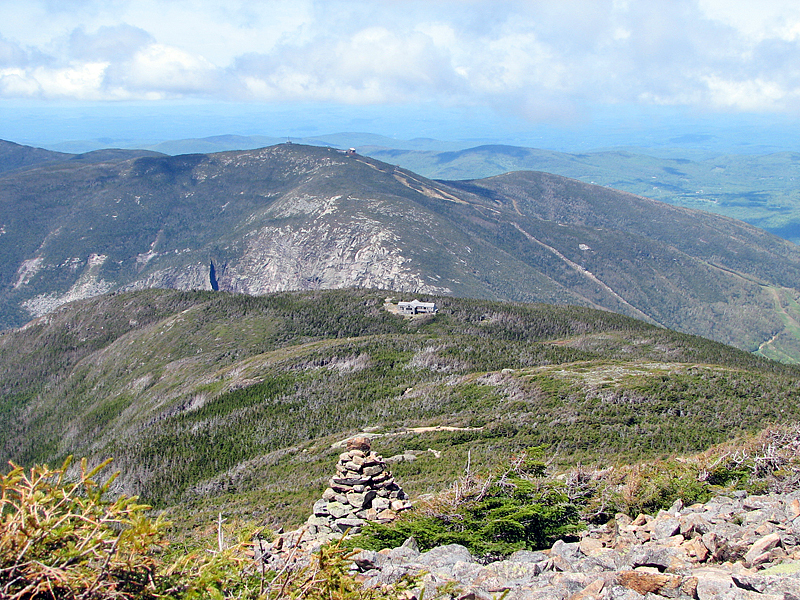 The clarity of the air also helped foster the illusion that Cannon Mtn and the Cannon Cliffs were not quite so far off. 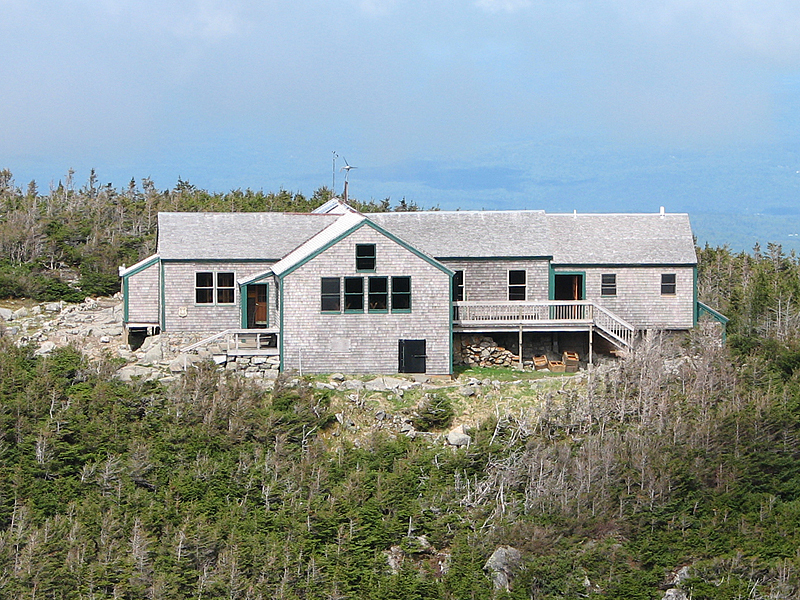 In one closeup photo that I took, they almost appear to be rising directly out of the ridge behind the hut. Of course, the zoom lens on my camera also helped me get good shots of Lonesome Lake, the Cannon Mountain summit observation tower, gondola station, and snack bar, and the old Mittersill ski area, now a part of Cannon. 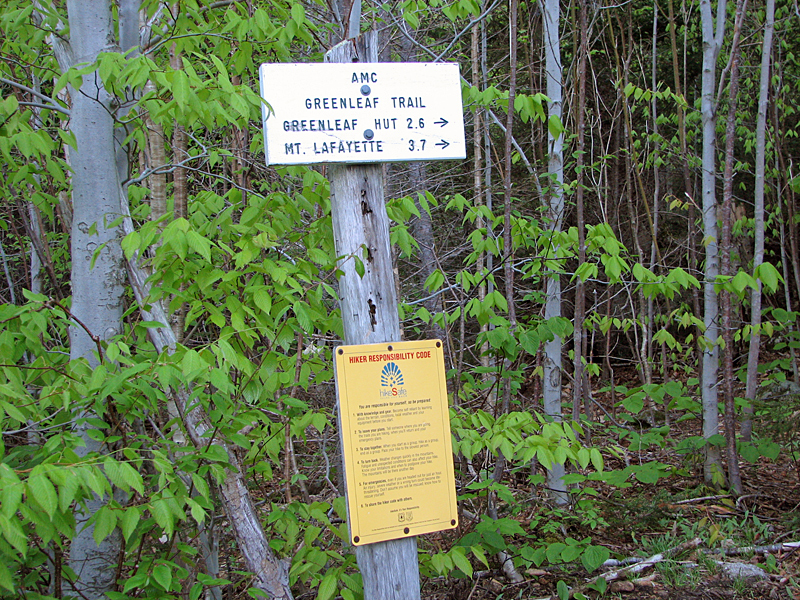 Greenleaf Trailhead. This was my first trip up the Greenleaf Trail to the hut. I was looking forward to seeing Eagle Pass. Eagle Pass. Unfortunately, there's no way to take a panoramic view of the entire cliff face or the full length of the pass, which is more impressive than the photo would suggest. Eagle Lake. 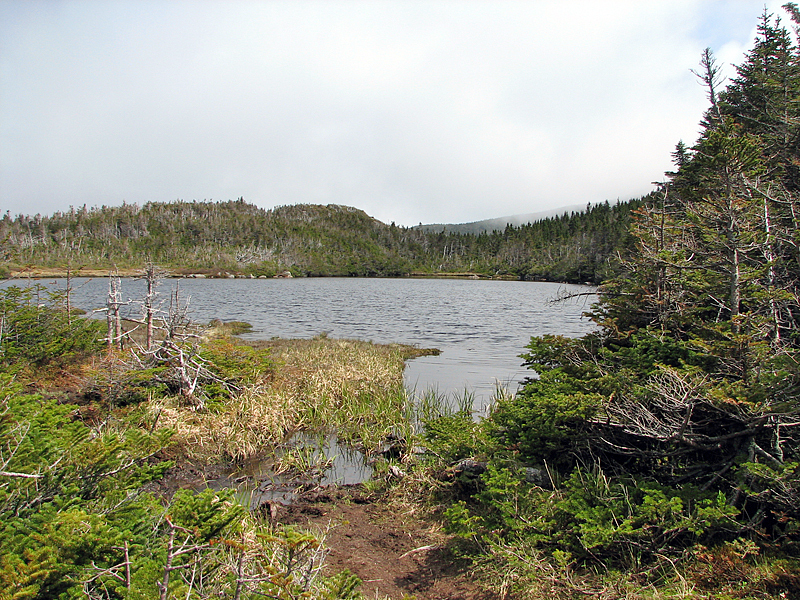 Located just below Greenleaf Hut, the Lake is similar to Red Pond by Mt Eisenhower, in that it's slowly turning into a bog. 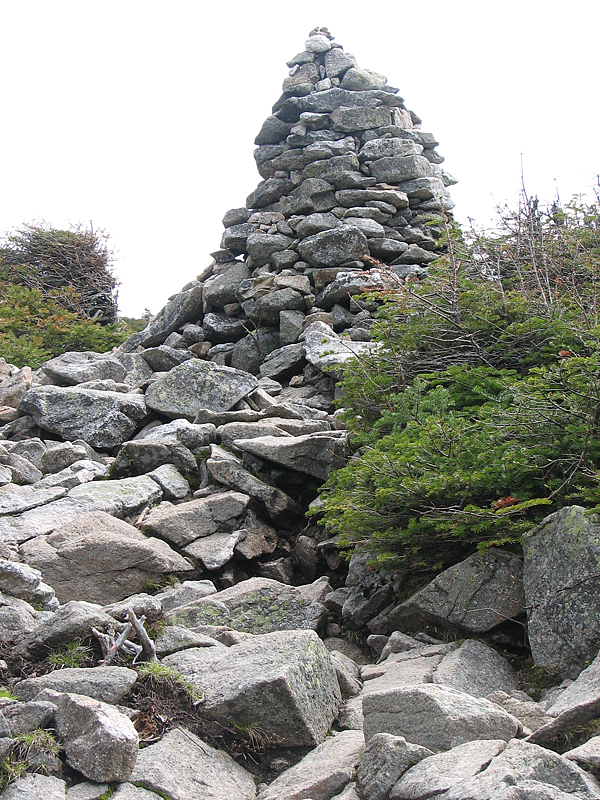 Large cairn marking the path of the Greenleaf Trail up the west face of Mt Lafayette. 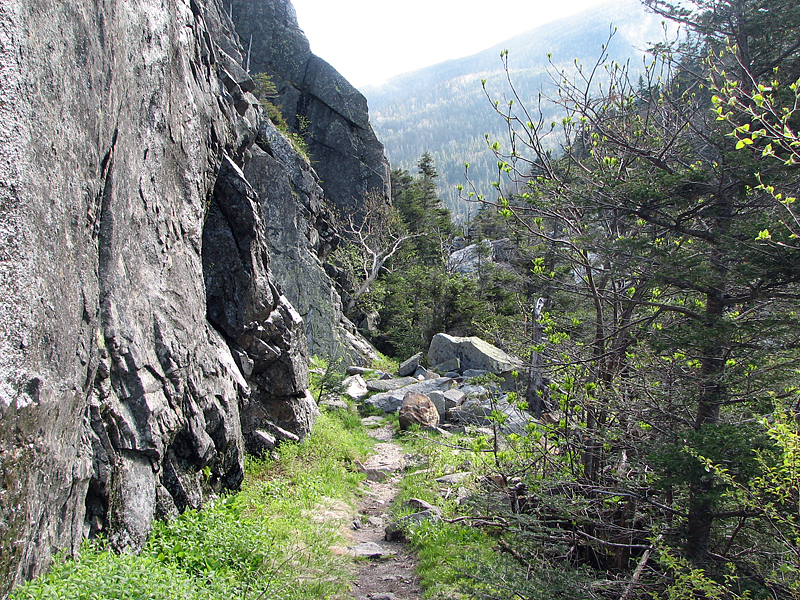 The rocks in the foreground are the trail. 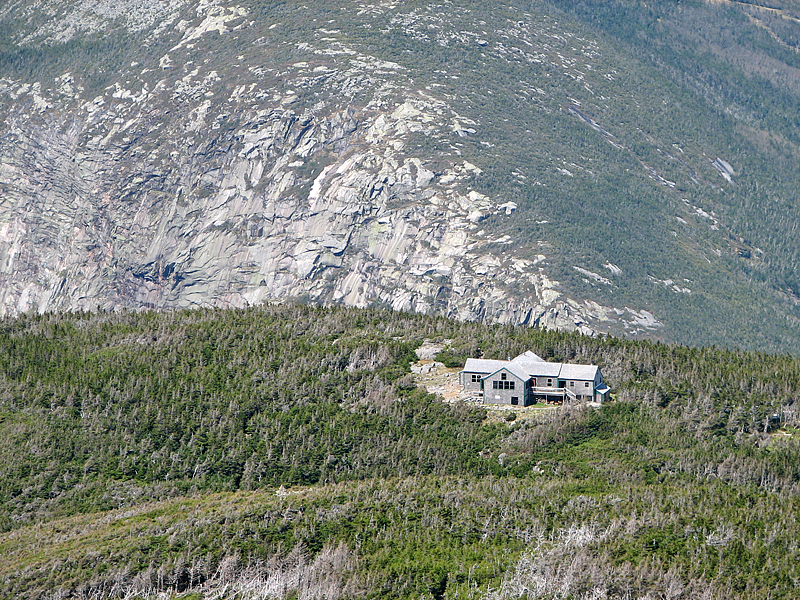 Closeup of Greenleaf Hut from the trail, about halfway up Mt Lafayette. 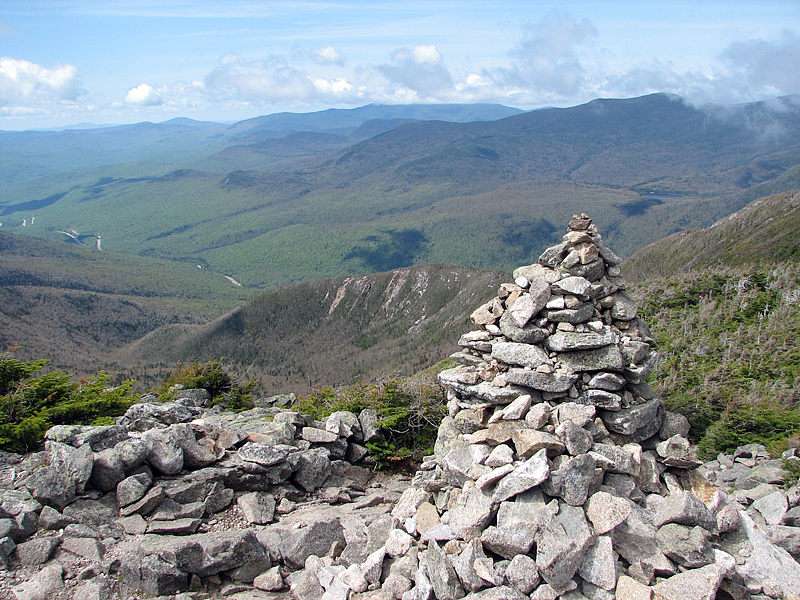 Another cairn with Rt 3 in Franconia Notch in the distance. The ridge directly behind the cairn is Agony Ridge, the route of the Old Bridle Path. 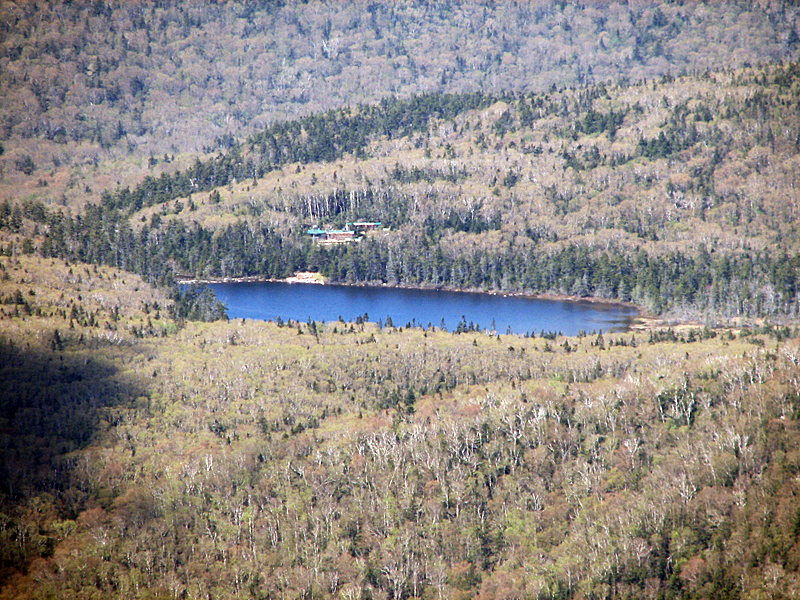 Closeup of Lonesome Lake. The green roofs of the hut and the dock/beach area below it, are clearly visible on the far side of the lake. Getting close to the top. 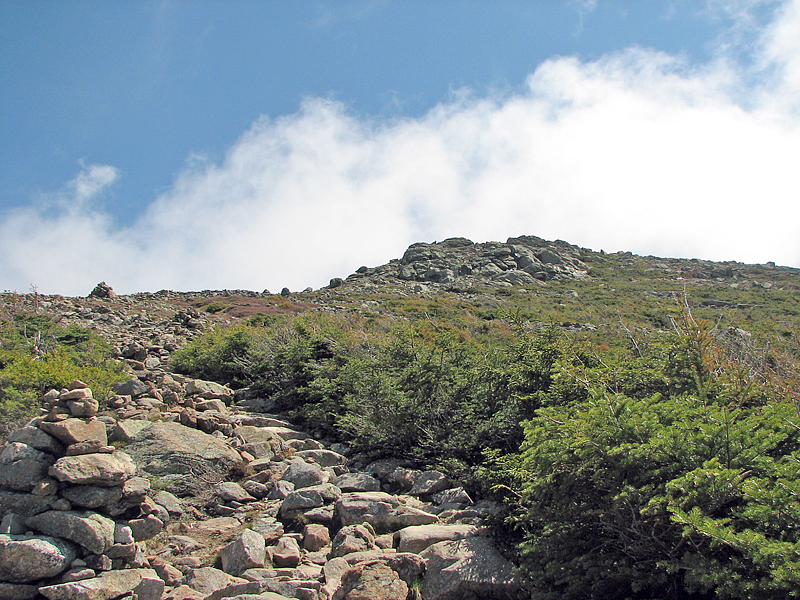 Looking up the trail, the summit is somewhere behind the rocky outcrop. Looking down to Greenleaf Hut. Cannon Cliffs and the summit of Cannon look deceptively close, although they're on the other side of the notch. 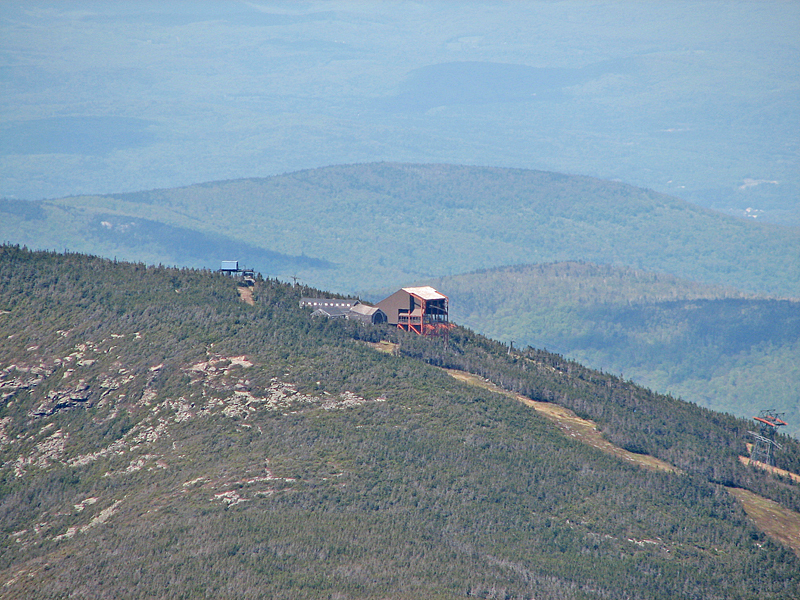 Closeup of the summit of Cannon Mtn with the observation tower, gondola station, and snack bar. It was only two months earlier that I had climbed Cannon and lost one of my snowshoes. Closeup of Greenleaf Hut with Cannon Cliffs in the distance. Once again, the cliffs almost appear to be rising out of the ridge behind the hut. 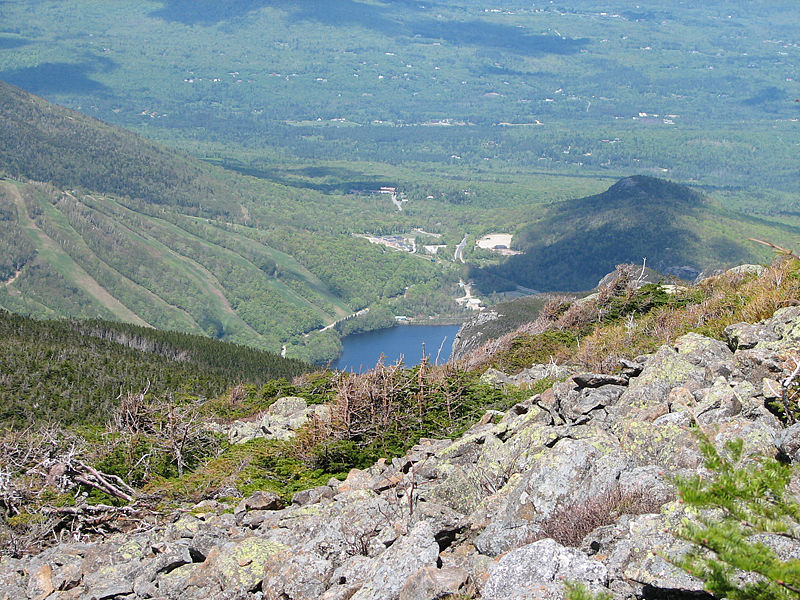 Closeup of Echo Lake and the old Mittersill ski trails that are now part of the Cannon Mountain Ski Area.